About 18,000 years ago, during the last ice age, the Yukon was a menagerie of exotic animals – scimitar cats, giant short-faced bears, and huge, lumbering woolly mammoths, among many others. Until recently, scientists thought those “others” included the mammoth’s distant cousins, mastodons. Mastodon, by George Teichmann. Courtesy of Yukon Palaeontology Program. And they had the radiocarbon dates to prove it. 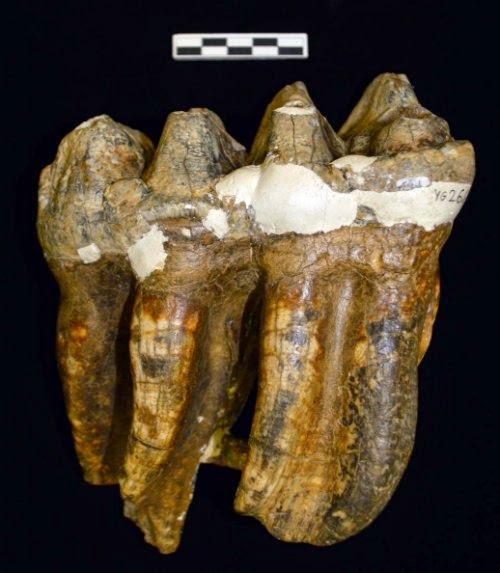 Two mastodon teeth from the Yukon had been reported in the scientific literature as dating from 18,000 years ago and 24,000 years ago, respectively. But, increasingly, the dates didn’t sit right with Yukon government palaeontologist Grant Zazula. The more scientists learned about the ecology of the Yukon 18,000 years ago, the more puzzling the presence of mastodons became. You see, mastodons were common in the mid-latitudes of North America, where they roamed the conifer forests, grazing on forest plants and browsing the twigs and needles of the trees. But both reported dates put mastodons in the Yukon at the height of the last glaciation. And there were no trees. At that time, when most of Canada was buried in ice, the Yukon lay along the eastern edge of a vast, cold, dry, grassy plain that reached all the way to Siberia. It was perfect for grass-eaters, such as the woolly mammoth, but the cold and the lack of trees wouldn’t have suited mastodons. What were tree-chomping cousins of elephants doing in a landscape virtually without trees? Actually, Zazula wondered, were they there at all? The teeth were the real deal, but what about the dates? In the years since the teeth were dated, scientists have improved dating technology and learned a lot about the materials they’re working with. And more mastodon fossils have turned up. A truckload of them, in fact – courtesy of Yukon gold miner Earl Bennett. Zazula met Bennett a few years ago, not long after he started his job as Yukon palaeontologist. Bennett told him he’d found a partial mastodon skeleton in the Klondike goldfields, where so many Yukon fossils have been discovered. The next day, he showed up at the palaeontology lab with a pickup truck full of giant bones. So – with more bones and with new approaches to dating them, Zazula set out to see if mastodons really had adapted to life on a dry plain. First, the original teeth were re-dated, using new techniques. This time, both showed as more than 50,000 years old. Radiocarbon dating only goes back reliably to about 50,000 years, so they could well be older. To check the new dates, Zazula decided to date as many mastodon fossils as he could find. Altogether, he and his team (there are 15 named authors on the paper reporting the findings) managed to get 53 new dates on 36 fossils. The dates consistently came back near the 50,000-year limit of radiocarbon dating. Ultimately, the scientists concluded that mastodons last lived in the Yukon about 75,000 years ago, when a warm period between glaciations (called an interglacial) lasted long enough for forests to grow and forest creatures, such as the mastodon, to move into them. Then the ice came back and the forests died – and so did the mastodons. But how could those first reported dates be so wrong? It’s easy. The samples were contaminated by carbon from much younger sources – humic (organic) acids in the soil and even the materials museums put on fossils to preserve them, Zazula said in an email interview.. The error wasn’t due to carelessness on the part of the first dating labs. Only recently have scientists developed ways to separate old carbon from new. Zazula’s tests were done with a technique that isolates a single amino acid, hydroxyproline, that occurs in collagen – a protein in bones and teeth. 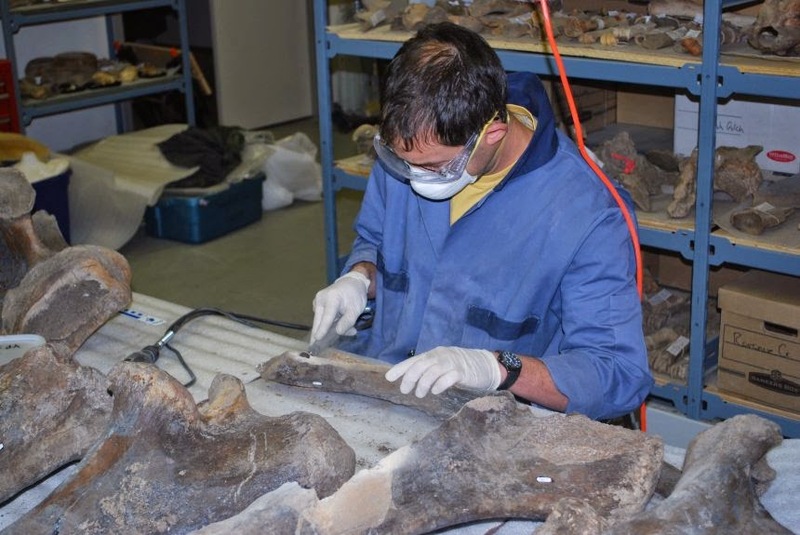 Grant Zazula takes a sample of mastodon bone for dating. Museum specimens can be contaminated too, he said. With younger specimens, around 10,000 years, it’s not such a problem, because they still contain plenty of radioactive carbon, Zazula said. But by the time a fossil is 50,000 years old or more, there’s almost nothing left to sample. Separating a few molecules of old carbon from the mass of newer material sounds – and is – technically difficult and frustratingly fiddly. But the resulting information has rewritten thousands of years of history and solved the lingering mystery of the misplaced mastodons. Here are a couple of news stories on the mastodon research: at CBC and in the Globe and Mail. You can listen to Grant Zazula talk about mastodons on the Dec. 6, 2014 episode of the CBC radio program, Quirks & Quarks. Here’s a lengthy and well-illustrated set of posts about Yukon palaeontology and mastodons on the Mostly Mammoths, Mummies and Museums blog: Part 1 and Part 2. Part 3 is still to come, so keep your eyes open! 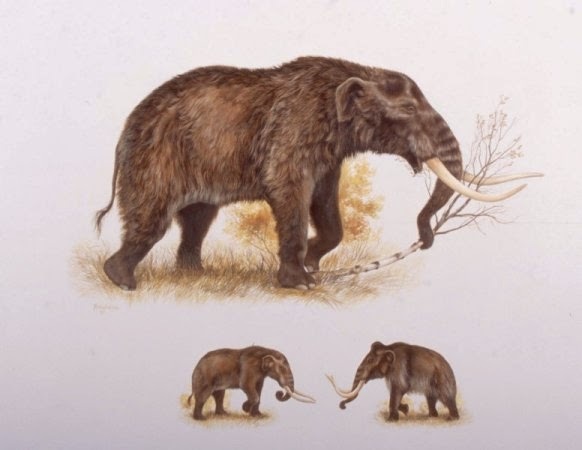 The article setting out the results of the project was “American mastodon extirpation in the Arctic and Subarctic predates human colonization and terminal Pleistocene climate change” in Proceedings of the National Academy of Sciences, Vol. 111 No. 52, which was published online (but behind a pay wall) on Dec. 1, 2014. 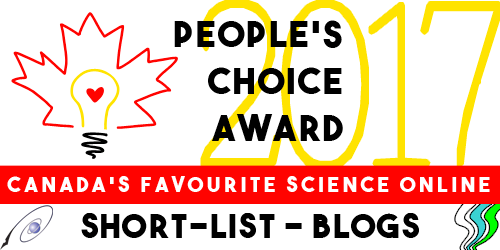 The full list of authors is Grant D. Zazula, Ross D. E. MacPhee, Jessica Z. Metcalfe, Alberto V. Reyes, Fiona Brocke, Patrick S. Druckenmiller, Pamela Groves, C. Richard Harington, Gregory W. L. Hodgins, Michael L. Kunz, Fred J. Longstaffe, Daniel H. Mann, H. Gregory McDonald, Shweta Nalawade-Chavan, and John R. Southon. Neuroplasticity - Can We Upgrade Our Brains?